Welcome to the third session of our swim season!! We're coming off an amazing first two trimesters and look forward to finishing our season strong! Click here for our New Member Welcome Packet. Make sure to go over this before registering. Once you've completed the registration process and paid your fees, your swimmer can start swimming!! We will handle your Pacific Swimming registration and finalize your registration to get your swimmer onto the roster. Your account and email will be activated once our Registrar finalizes your registration, usually within 2-3 days. Credit cards used to pay fees are automatically uploaded into your billing account for monthly auto payments. Practice schedules can be found at www.burlingameaquatics.com under the Swim Team tab. And the coaches are awesome at sending weekly updates, so keep an eye open for them. 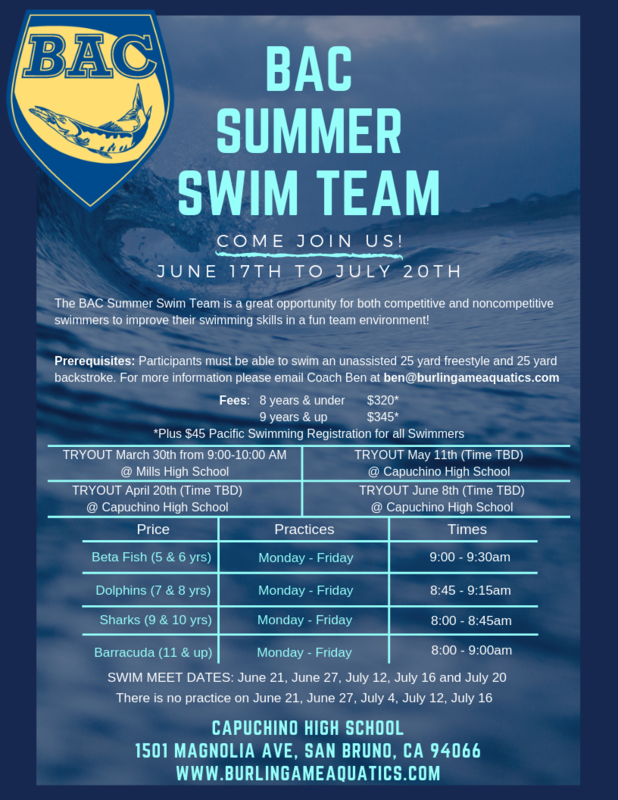 Please email Coach Ben Chung with any questions about swim groups (ben@burlingameaquatics.com) or email our Controller, Jenny Smith with any questions about the registration process (accounting@burlingameaquatics.com).